The sturdy green 1940s suitcase from the attic was full of photos. It is merely a cork bobbing on the sea of artifacts we have inherited from family and just-barely-family. We have skimmed through a lot of it in the process of stabilizing and sorting the mess. I’ve thumbed through a zillion photos of old Swedes and Norwegians, and the houses they lived in, but the train wreck was unforgettable. It has been a several-year process to look into it. 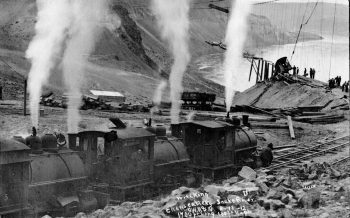 First were the mounted 8x10s of the trains and construction projects. Some are fading and falling apart, so I did a scanning project to preserve the images. They went back into storage, as did the scans. Several years later an album of smaller contact-printed snapshots and postcards came to the surface, and those same images were there. This got me back into scanning; out of a sense of obligation to the past, even if I didn’t understand what I was seeing. Hundreds of 3200ppi scans later, I am starting to absorb some context from the images. A high resolution scan can pull out details the eye misses in the little snapshots and can bring back the full tone range of the subjects. I spend hours opening images in Photoshop and zooming into the details; faces, tools, clothes, the hints of the ongoing events. 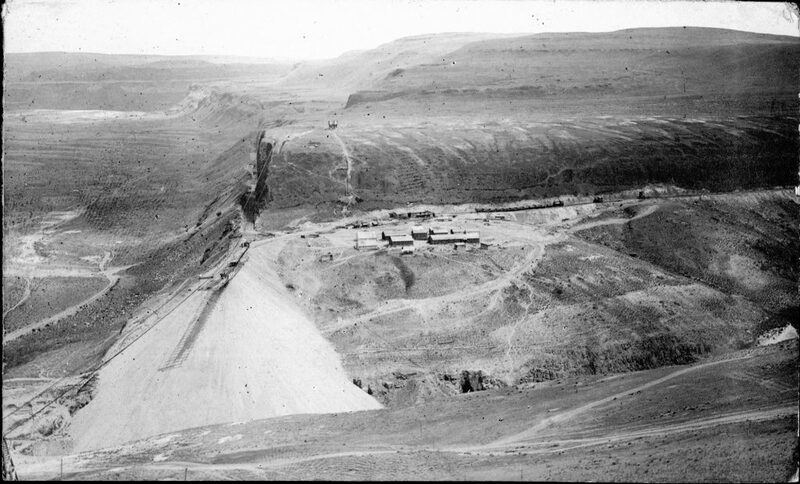 From the notes on the prints it was built over Fields Gulch on the Snake River in the Spring of 1912. We haven’t got the gulch located for sure; we think it was near Walla Walla, Washington and I’m guessing on the Washington side of the river. 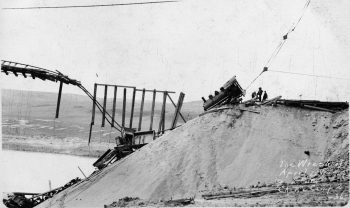 My hope is to get these images into the hands of people with knowledge of the railroad and construction history and maybe fill in some gaps in everyone’s narrative. At this point, I don’t know who Carlson was, or Chew, or Fields. I don’t know why they were building a railroad on cables. I don’t have any story from my family, so I am forming hypothetical snippets and waiting for wisdom to fall from the sky. 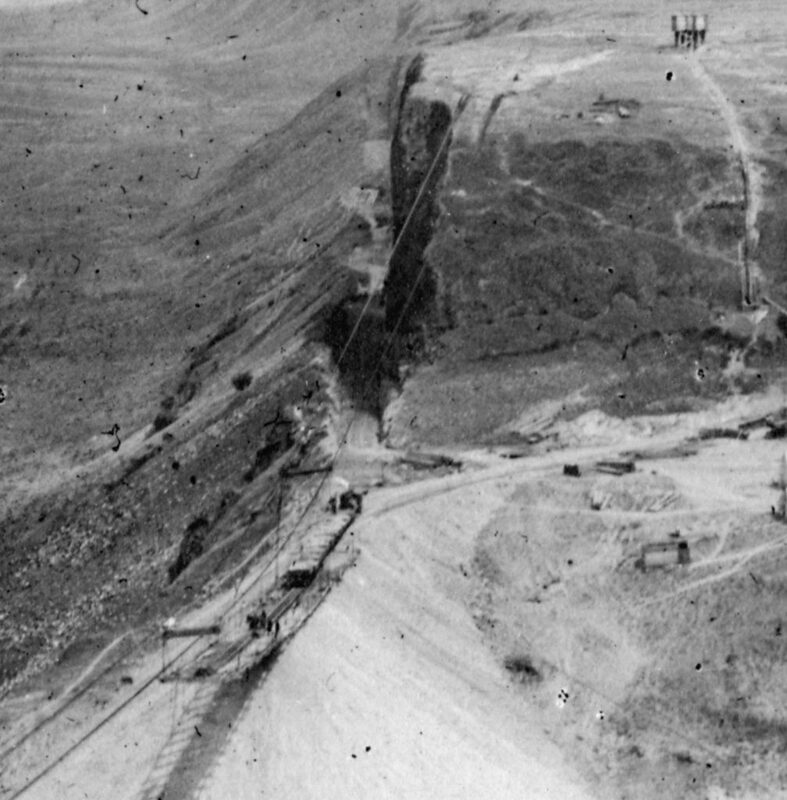 They built a rail line down the gulch and created an embankment to be the “take off” zone for a short train. 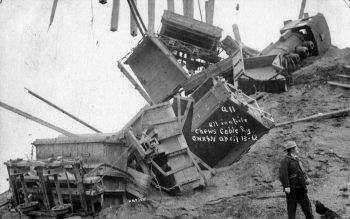 The two large cables anchored to the bluffs above. The crew lived in a temporary village nearby. 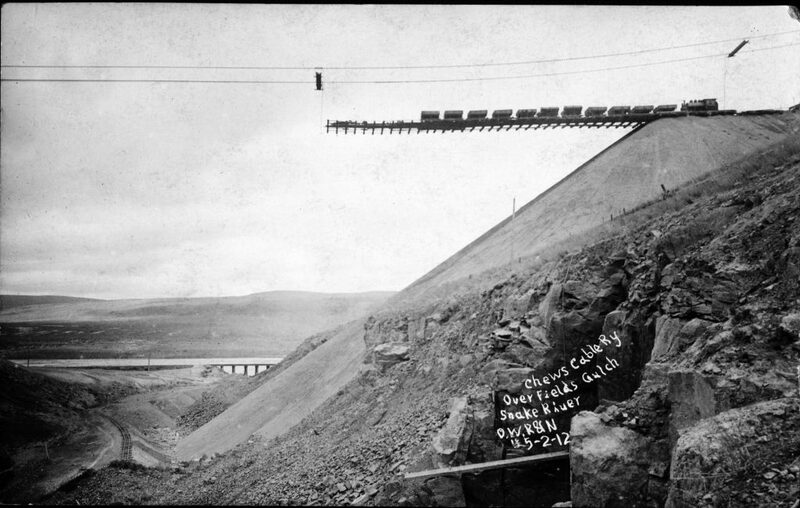 A short set of ties and rails was suspended from the cables like a sling. There is large cross piece on the ends and many cables run down to the tracks from the cables in between. Here, the train seems to be poised for a trip across the gulch. The train lies in a jumble at and over the edge of the take off ramp. They have a cable (from the bluff above?) and a block and tackle to pull the engine back up. They now have three engines fired up and waiting. Will they hitch up to the first engine and yank the cars up the hill with brute force? Some of the cars are back up. Did the 3 locomotives do the job? The dates don’t add up? The photographer notes the dates on the prints. 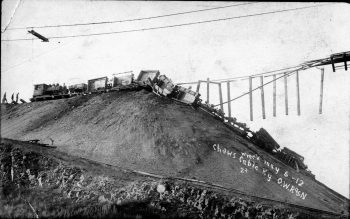 The train that appears to be ready for a test is dated in May, 1912 but the wreck shots are dated in April. Could it be the months are mislabled and it was all in May, or April. Or, did they wreck in April and repair the track and were ready again in May? There are two stories possible. My guess is they did not rebuild, but it would be great if they did and the cable railway was a success. BTW: Two photos have the name “Harlow” written separate from the notes. Is this the photographer. This is where we need more history.